Why you should test your pool water regularly. Regular testing of your pool water is important for many reasons. Testing the pool water is the first step to treating and balancing the water so that it is clean, clear and safe for bathers to swim in. When the water is within these ranges, bathers will also find that the pool is more comfortable. Their eyes shouldn’t sting, there should be no ‘chlorine smell’ and the water should feel soft and silky. The equipment in your pool prefers balanced water as well. When a pool is out of balance, the surface can become stained or corroded, scale can form on tiles, liners and fittings and metal parts – both the ones that show and the ones you can’t see – can start to oxidise. Balanced water will save you money as well. When the pool is balanced you will use less sanitiser and the pump will need to run less, as you don’t need to compensate for poor water chemistry by putting an extra load on the filtration system. So testing is important and it needs to be accurate. Perhaps it should be more accurate than comparing a shade of pink on a test strip to other shades on a card? What does digital pool water testing have to offer? For many years there were only two alternatives for testing your pool water: unless you wanted to send a sample to a lab! Pool test strips or liquid pool test kits were the only way of testing pool water. The liquid test kit was perhaps a little more accurate and a professional version would be made from glass rather than plastic and have a greater range of comparison colours. But the fact remains that in testing pool water you are looking for a numerical value and the reagent in the kit or strip is giving you a colour. A digital test will give you that number that you are looking for. 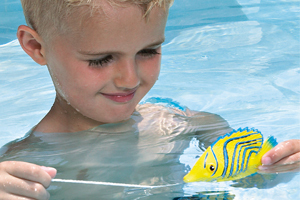 There are various different types of digital pool water testers available. Digital meters use metallic probes and internal software to measure various aspects of your pool water. They will measure sanitiser levels, pH and TDS (Total Dissolved Solids) but few will measure TA or CH levels as well. To be fair to these meters, Total Alkalinity and Calcium Hardness tend not to change very quickly or very often and a separate test every few months should suffice. Photometric Scanners use an internal spectra-photometer and powerful software to calculate precise readings. You simply insert a sample of pool water and a liquid or tablet reagent into the device and the hand-held scanner takes over. They will test your pool for a wide variety of water balance parameters and this type of digital pool water tester also computes the recommended amounts of chemical to add to your pool if an adjustment is necessary. Digital strip readers work in a very similar way but you just dip a test strip in your pool than insert that into the reader. And, of course in this day and age, it comes as no surprise that you can use your smartphone to test and balance your pool water. There are water testing apps that will read a test strip by taking a photo of it and then give you a reading. There are also apps for your phone that will give you water balance adjustment recommendations when you enter in your test results. Digital water testing certainly has the potential to give you far more accurate results than most previous methods and therefore an easier job of treating and balancing your pool. operator of a 14,000 gal spa, a 40,000 gal activity pool and a 110,000 gal lap pool for a homeowners association. Found some great information here. Thanks, glad we could be of help.